Nine year-old chess star Daniel Shek made all the difference in the final match of the season for Camberley Chess Club. Daniel, a Fleet resident and a student of Yateley Manor School, easily equaled his vastly more experienced opponent from Fleet Chess Club to clinch Surrey Border Chess League Bell Trophy Cup Final with a 3-2 winning score. The Cup final brought together two of the best teams in Surrey after a hard fought campaign that started in September of 2017. Camberley Chess Club broke another record in 2018 by winning the Bell Trophy for the ninth time since the competition started in 1975 and the team captain, John Upham, has won all 18 matches out of 18 contested ! 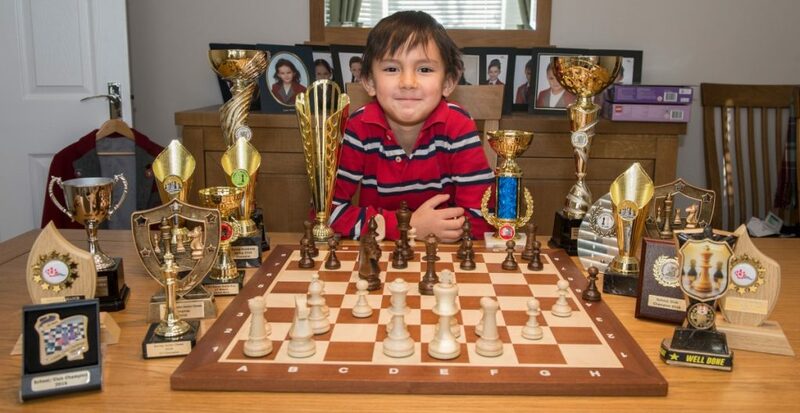 Daniel is one of the most promising nine year old chess players in England and regularly plays tournaments abroad and in the UK supported by father Kim who runs Kim’s Plaice, a successful Fish & Chip restaurant in Frimley High Street. Camberley Chess Club meets every Tuesday evening in Camberley Baptist Church, 15, Frimley Road, GU15 3EN.